After you're done with the taping, mudding, texturing and sanding, two coats of paint are all you need to finish off your newly drywalled room. Well, almost all -- because to get the paint to cover evenly, you need a coat of primer -- unless you're using an all-in-one topcoat that includes primer. Either way, the quality of the job depends on the paint and the tools you use as well as on the painting technique. Smart painting practices ensure the paint goes on the wall -- not on you. The quality of any paint job depends on how well you've prepared the substrate, and this is especially true for drywall. Every raised edge and gouge that you don't see on the unfinished drywall will be visible under a coat of flat or eggshell paint, so use a work light to help you find them. Shine it from various angles to highlight the defects and sand them by hand. When you're satisfied, don't remove sanding dust by wiping with a wet rag -- that could damage the mud. Instead, dust it off with a feather duster or by fanning with a rag. A roller is the go-to applicator when painting drywall; even when spraying paint, a seasoned pro back rolls to avoid streaks and drips. Avoid polyester roller covers, which spatter and leave lint; lambswool or mohair covers are more reliable. Use a 1/4-inch nap for semi-gloss finishes on smooth drywall, a 3/8-inch nap for flat finishes, and a thicker -- up to 1-inch nap -- for textured surfaces. The paintbrush you use is just as important; those with tapered bristles typically hold paint better and produce fewer brush marks than brushes with straight edges. Use a synthetic-bristle brush for latex paint; water makes natural bristles swell and go limp. 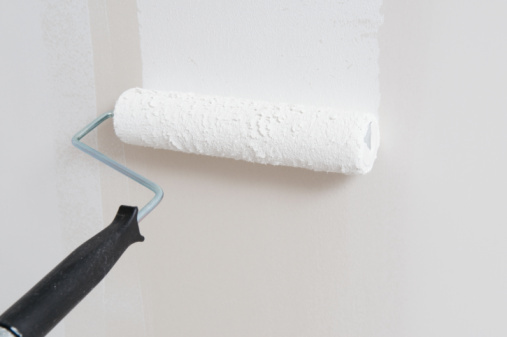 All-in-one paint-plus-primers are best for already finished walls; when you're painting new drywall, you should always apply a high-quality polyvinyl acrylic drywall primer. PVA is an adhesive that fills pores in the paper and drywall mud and forms an impervious coating to which paint easily adheres. Moreover, high-quality primers contain a high concentration of solids that help compensate for defects in the drywall paper, mud and texture. A single coat of primer is almost always sufficient, and if you're painting the wall a dark color, consider tinting the primer. That way, you save paint when topcoating. It's always best to cut-in by painting around the edges of the wall with a paintbrush before you roll the main part. To avoid streaks, always brush toward the wet edge of the material you've just applied. When rolling, overlap the material you've already applied by half the width of the roller. Keep things neat by using a disposable rolling pan in your rolling tray and pouring paint into a separate bucket for loading your paintbrush. For an extra-smooth finish, sand lightly between coats with 150-grit sandpaper after you're sure the paint is dry.